Dog costs may be more than you think when you adopt a pet. 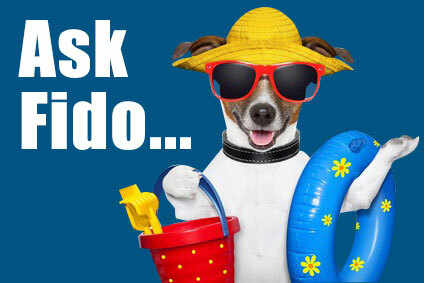 Home Dog Care 101 At Home & Play Do you know the costs of a dog? It takes more than a squeaky toy and a bag of kibble to give a dog a good home, even though most people spent more time browsing breeds than calculating costs. According to the American Pet Products Association (APPA), Americans are expected to spend an average of $1,649 year to own a dog compared to the $1,464 they spent in 2011-12. More than half of that — $852 — will be spent on veterinary care, both routine care ($231 a year) and surgical care ($621). The next biggest bites out of the dollars we spent on our dogs is $327 for kennel boarding followed by $239 a year for food. Grooming and grooming aids, vitamins and treats cost $61, $64 and $65 a year respectively. Toys come in last at $41 per year. First year expenses, like getting the dog in the first place, spaying or neutering and shots, can drive costs up. Other factors such as a dog’s age, health, size and type of coat as well as the owner’s schedule or frequency of travel will also affect costs. If you work long hours and need to hire a dog-walker, you may end up paying between $4,000 and $5,000 a year. If you travel often, be sure to consider the cost of kenneling before you decided to get a dog. Don’t over look the cost of training. A well-trained dog is easier to control, which in turn, reduces the risk of running into the street and being hit by a car or getting into a tangle with another dog. According to Dr. Louise Murray, vice president of the American Society for the Prevention of Cruelty to Animals’ Bergh Memorial Animal Hospital in New York City, told Lilly that mix-breed, 10- to 20-pound dogs are usually the least expensive dogs to own. 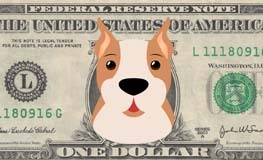 Geoff Williams, a writer for U.S. News a& World Report’s Money Personal Finance section, advises people thinking getting a dog to think about costs in terms of the dog’s lifetime rather than over the course of a single year. PetInsurance.com estimates these lifetime cost at $20,000. RaisingSpot.com estimates that a dog that lives 12 years might cost anywhere from $4,620 to nearly $33,000 over the course of its lifetime. Adopt, don’t shop. Rescuing a dog is much less expensive than purchasing a pedigreed dog from a breeder ($200 to $300 versus $1,000 or more). If you do get a dog from a breeder, be sure to do your homework to be sure that he or she has a track record for well-bred, healthy puppies. Small dogs are less expensive than big dogs. Bigger dogs eat more and food is the third highest expense for dog care, according to the APPA. Cutting corners on the quality of food you feed Fido can lead to poor health and more vet bills down the road. Plan ahead for emergency or serious medical issues. An emergency that doesn’t require surgery can cost $2,000 to $3,000, while emergency surgery can cost between $3,000 and $5,000, according to Dr. Murray. More than half of all dogs aged 10 or older get cancer, with treatment costs averaging more than $3,500. Get pet insurance — but do your research carefully. Annual premiums for pet insurance vary widely depending on a dog’s age, breed and coverage required. Some policies cover emergencies and some only basic care. Many pet owners complain that they have to pay for vet care before services are provided, only to find out after the fact that an insurer won’t pay. This is definitely a “buyer beware” cost. You can get some help with comparisons at PetInsuranceReviews.org. Grooming. Your choice of a dog in the first place makes a huge difference in what you’ll be facing in terms of grooming costs. A short-haired dog isn’t going to need the precision grooming of breeds like poodles or certain kinds of terriers like Yorkies or Schnauzers. Many dogs can be bathed and brushed at home. Don’t skimp on grooming that improves a dog’s health like claw-clipping and dental care. Toys. The toys most often found in pet stores are ones that appeal to owners, not necessarily dogs. While some breeds love chasing after a ball, others could care less. Some dogs are chewers. Some dogs destroy toys as fast as you can bring them home. Don’t buy toys that your dog won’t play with. Keep in mind that you can also make toys for your dog such as braided pieces of blankets or towels. While any dog you bring home will be pulling money from your wallet, most dog owners agree that having a dog in your life is . . . well, priceless. C is for Cost today in the 2014 A-to-Z Challenge for bloggers. Every day in April (except Sundays), participating bloggers will write a post for the appropriate letter of the alphabet. Come back tomorrow for D is for Disaster Preparedness.